Excerpt from “811 Director Profiles”, in The American Locator by Underground Focus. J.D. 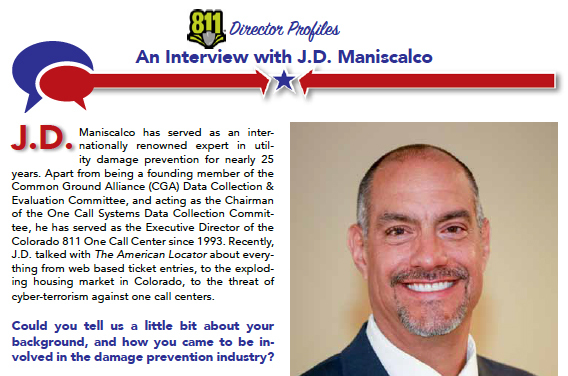 Maniscalco has served as an internationally renowned expert in utility damage prevention for nearly 25 years. Apart from being a founding member of the Common Ground Alliance (CGA) Data Collection & Evaluation Committee, and acting as the Chairman of the One Call Systems Data Collection Committee, he has served as the Executive Director of the Colorado 811 One Call Center since 1993. Recently, J.D. talked with The American Locator about everything from web based ticket entries, to the exploding housing market in Colorado, to the threat of cyber-terrorism against one call centers. Could you tell us a little bit about your background, and how you came to be involved in the damage prevention industry? Well, my educational background is in music, and I went to school at the University of Northern Colorado on a scholarship. I was a professional jazz drummer and had some success with jazz and fusion groups in the early 1980s and 90’s, but it was pretty clear that it was going to be hard to make it in the music industry, so I started to get involved in computer science and information technology. I partnered with a friend of mine and we started our own business in the IT sector, setting up local area networks to connect district attorney’s offices with police departments and county court systems throughout the state of Colorado. I ended up managing that company for five years, and then around 1990 I met the executive director of the Colorado one call center and they were in need of assistance to migrate to a new computer system. Acting as a provider of IT services was my introduction to the one call center and I was successful at making that migration and assisting them with their needs. They offered me a full time position in 1991 as assistant manager, and then I became the executive director in 1994. How long has the Colorado 811 one call center been open and how many employees do you have? We currently have 53 employees, which grows some in the springtime as we do hire some seasonal staff. Colorado is known for drastic changes in climate, unlike some states that have slight changes in their seasons. Their incoming ticket volumes are pretty consistent year round, while ours escalate in the spring and summer, and then decrease in the autumn and winter. Our operation has been in existence since 1987, so 2017 will mark our 30th year of operation.